Cookie Chanel loves vintage, she drives a 1948 Buick, decorates her home with a mixed years design and owns It’s Vintage Y’all, a vintage clothing shop in Sugar Creek, Georgia. All would be well except for one thing, she can see and talk to ghosts. Sometimes when she buys a piece of vintage clothing, the ghost of the person who owned the item appear to her and stick around until they can figure out why they have not crossed over. This often requires her investigation an unsolved murder or suspicious death. In fact, her friend Charlotte Meadows is dead. Cookie is the only one who can see and hear her. She helped Charlotte discover who murdered her. Now the ghost hangs around to give fashion advice and help Cookie solve murders. If you are looking for a cozy series that is serious and believable, this one is not for you. If you are looking for a fun, paranormal, sassy cozy mystery, then you will enjoy this one. Cookie’s best friend Heather is suspected of killing the lead actor in the local play. Cookie is working for the theatre company in costuming so has easy access to the theatre. This gives her the perfect reason to be in and out. Of course, she has also picked up a ghost in the basement of the theatre, a young woman who has no memory of what happened to her, but wants to find out. Cookie, Charlotte and Peggy work together with Dylan and Ken (two men who fancy Cookie) to solve the crime and get Heather off the hook. I do enjoy this series. Charlotte is sassy, classy and strong-willed. She gets Cookie involved in things and snooping in areas that she never would head without that push. Cookie, unfortunately, is the typical sleuth who jumps in without thinking and often puts herself in danger. This book it was really obvious and I did get frustrated with her a few times. Heather is usually a bubbly, somewhat air-headed female who pretends she is psychic, but can read a mean tarot card. Dylan the local detective is in a budding relationship with Cookie and although he often warns her about interfering in his cases, his heart is not in it and often gives Cookie information. Last but not least is Ken. He is the local lawyer who would love to have a relationship with Cookie, but is beginning to realize that they will just be friends. Each book has a new ghost, this one has Peggy. A teenager from the 1950s who snaps her gum, and eggs Charlotte on. A fun group of characters who I enjoy spending time with. The mystery moved quickly and was able to be solved by asking a lot of questions, following people around and noting their actions and generally making a nuisance of themselves. The murderer finally has enough, tries to kill Cookie and then reveals herself. It was fun and I will read more as they are a quick read and help to cleanse my mind after reading a thriller or dark mystery. The publisher, Kensington, generously provided me with a copy of this book upon my request. The rating, ideas and opinions shared are my own. About the Book (From Goodreads): When Cookie Chanel moonlights as a costume designer for a local theater, murder takes center stage . . .
About the Author: Rose Pressey enjoys writing quirky and fun novels with a paranormal twist. The paranormal has always captured her interest. The thought of finding answers to the unexplained fascinates her. I’ve read the first one in this series and thought it was really fun. But I really like cozies with a theatre connection, so I’m thinking now’s the time to continue the series. Great review! Thanks Christopher, I hope you enjoy it if you get a chance to read it. 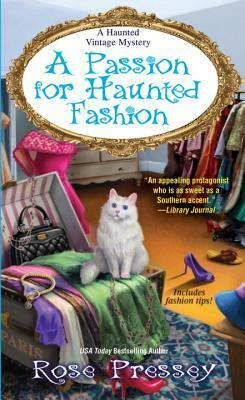 Love the review and “fun, paranormal, sassy cozy mystery?” Yes, please! But wait, 3.5 stars? Did it drag a little for you? The ghosts are great, but the MC takes too many chances. This sounds like a fun and charming series, Carla. I love the theater connection. You are right that we need these kinds of books to break things up. I love ghost stories! Thanks for a great review! Then this series is for you, but these are not creepy, scary ghosts, these are fun, smart and sassy ghosts. This book sounds like a lot of fun! I’m glad you were able to enjoy it overall. I like the sound of this series, Carla. Sorry Cookie annoyed you a bit in this installment though. Great review! She just took way too many chance. It was not as bad in the next book.